RPost has extended its Registered Email services to create a new class of mobile messaging, bringing the security of BlackBerry email to any recipient regardless of where they access their email. This new RPost app for BlackBerry is tightly integrated into the native ‘compose email’ function, permitting users to scroll up one position to ‘Send Registered’ email messages. Receive auditable and time-stamped proof of content in replies to the BlackBerry sender's email, serving as records of responses to offers, messages, and negotiations. Los Angeles, CA --- December 5, 2011 --- RPost has extended its Registered Email® services to create a new class of mobile messaging, bringing the security of BlackBerry email to any recipient regardless of where they access their email. This new RPost app for BlackBerry is tightly integrated into the native ‘compose email’ function, permitting users to scroll up one position to ‘Send Registered’ email messages. “BlackBerry messaging is known for its security. But, that security ends if the recipient is not also a BlackBerry user on the same network,” adds Khan. 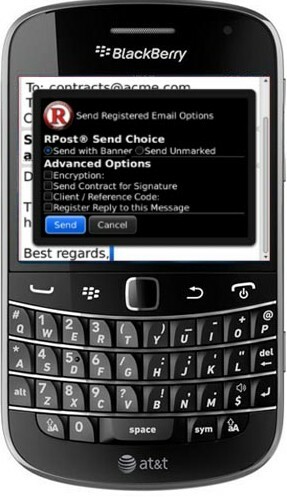 “RPost relieves the sender from concerns about how the recipient will access their email and whether their point of access will cause a data security breach.” With RPost encryption options, the sender knows – and has proof – that the message was received encrypted by the recipient whether on-or-off the BlackBerry messaging network. RPost’s BlackBerry application allows users to send Registered Email messages for the most legally robust record of who said what to whom and when by email, with time-stamped proof of message content delivered to any recipient’s inbox. 5. Receive auditable and time-stamped proof of content in replies to the BlackBerry sender’s email, serving as records of responses to offers, messages, and negotiations. “Our customers who are real estate brokers have been asking for a tool that will let them send offers and counter offers from their BlackBerry devices when they are on the move, with robust time-stamped records of the offer details received under deadline,” remarks RPost CEO Zafar Khan. “We brought this and more to their mobile messaging in a manner that benefits all of our users, all over the world.” This release is now available in English, French, Spanish, German and Portuguese. For those BlackBerry users that send important email and worry about how to maintain useful records, users can finally have a court-admissible record of selected high value correspondence automatically routed to any other email address or any email repository in the form of a Registered Receipt email. This simplifies compliance with records management mandates. Any holder of these Registered Receipt email records can have RPost later authenticate the record and reconstruct the validated original message content, time-stamps and delivery information on-demand. RPost neither stores a copy of email messages nor receipts. The RPost technology has been granted 35 patents in 21 countries.